New ‘Ballads for the Age of Science’ Zoom a Little Zoom: A Ride Through Science: The release date is March 30th! New ‘Ballads for the Age of Science’ Zoom a Little Zoom: A Ride Through Science The release date is March 30th! 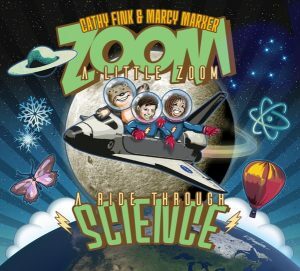 The two-time GRAMMY® winning folk and children’s music duo of Cathy Fink & Marcy Marxer will release their 46th album collaboration, Zoom a Little Zoom! A Ride Through Science, on March 30, 2018 on their Community Music label.With 10 new interpretations of tunes from Ballads for the Age of Science, a classic 1961 collection of educational science songs on such subjects as space, nature, weather and energy, and an Activity Guide featuring dozens of ideas for hands-on science fun, the album is intended to excite a new generation of scientists, engineers, and explorers. The original songs, written by lyricist Hy Zaret and composer Lou Singer, and performed by Dorothy Collins, Tom Glazer and other artists, appeared on the 1961 space race era album Ballads for the Age of Science. Academy Award nominee Zaret (1907 -2007) is renowned for writing the timeless hits “Unchained Melody,” “One Meatball” and “Dedicated to You.” He also wrote dozens of socially conscious songs for his public service albums, Little Songs on Big Subjects and Little Songs About U.N.
Zaret’s son Robert (Argosy Music Corp.) commissioned GRAMMY winners Cathy Fink and Marcy Marxer to create contemporary arrangements, selecting the best science-based earworms from the original six-LP Ballads for the Age of Science collection. Fink and Marxer assembled other top-flight musicians and the result is an upbeat album of catchy songs about rockets, constellations, animal habits, gravity, and more. The reworked songs aim to spark listeners’ curiosity to learn, and together they provide a resource to introduce elementary level science concepts. The new album includes an Activity Guide for each song by Lynn Baum (former head of School Programs at the Museum of Science in Boston), downloadable from the CD. The guide, which features ideas easy to replicate at home or school using household materials, will be available for free download soon at cathymarcy.com. In upcoming performances and videos, these activities will come alive – experiments and all. I received a copy of this CD and highly recommend! If you have a child that likes Science, they will love this CD!~SoCal City Kids. Cathy & Marcy are trailblazers in children’s and family music. Their relationship with family audiences spans over 35 years of live performances. They play dozens of instruments from banjo to mandolin to rockin’ electric guitar, steel drum and ukulele. Two GRAMMY® Awards (and 14 nominations), Parents’ Choice Awards, American Library Association Awards, National Association of Parenting Publications Awards, Early Childhood News Awards and Washington Area Music Association Awards all attest to the superb quality of their body of work. 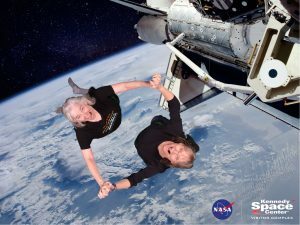 Along with the album release Cathy & Marcy offering a limited number of live concerts based on the new album complete with fun activities designed by Lynn Baum (formerly of the Boston Museum of Science), plus graphics, animation, and film from NASA. These always-touring artists are based in Maryland and North Carolina. The New York-born songwriter is best known today for his 1955 collaboration with composer Alex North, “Unchained Melody,” written for the Hollywood film, Unchained. That year, the song was recorded by more than 40 artists, including 3 chart-toppers, and was nominated for an Academy Award. Revived in 1965 by The Righteous Brothers, “Unchained Melody” became a worldwide hit once more, and gained momentum again in 1990 when The Righteous Brothers version was used in the 1990 film, Ghost. Parodies of the pottery wheel scene continue to be a staple of advertisements. With over 1000 recordings in multiple languages, including platinum records by The Righteous Brothers, Elvis Presley, Robson & Jerome, Gareth Gates, and Harrison Craig, “Unchained Melody” is #5 on the BBC’s 2012 list of the Ten Richest Songs. The Righteous Brothers original recording was inducted into the Grammy Hall of Fame in 2000, and the song was recognized with the U.S. Songwriters Hall of Fame’s Towering Song Award in 2007, just weeks before Hy Zaret’s passing at the age of 99. Self Disclosure: I received a free CD to facilitate this featured CD. Images and information were also provided by our friends at Sugar Mountain PR.